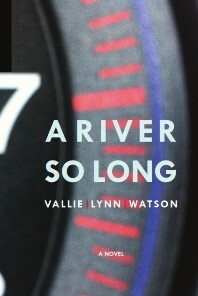 A River So Long by Vallie Lynn Watson with Giveaway! Welcome to another exciting publishing house spotlight tour from Novel Publicity. Join us as three new titles from Luminis Books–we’re calling them the Luminis Literary Triad—tour the blogosphere in a way that just can’t be ignored. And, hey, we’ve got prizes! That’s it! One random commenter during this tour will win a $25 gift card. Visit more blogs for more chances to win–the full list of participating bloggers can be found HERE. The other $25 gift card and the 3 autographed books will be given out via Rafflecopter. You can find the contest entry form linked below or on the official Luminis Literary Triad tour page via Novel Publicity. Good luck! After reading several far more ‘traditionally’ styled novels of late, the non-linear plotting of this story demanded my attention and engagement early, and never quite let go. Vallie Lynn Watson has a style that speaks clearly as we are presented with Veronica: a woman, who seems to want change, yet is utterly incapable of seeing the world through any eyes but her own. What emerges is a complex character study in a jigsaw puzzle format, leaving great gaps in the timeline, but those gaps seem to mirror Veronica’s psyche. Her lack of direction, focus and even strict moral sense all are lacking: her repeated changes of venue for work, the repeated changes of partners and the lack of feeling for and about her husband all give hints to the unsatisfied woman who is the only constant in the story. Yet, she never does seem to find a path that will provide her with the change that she seeks. While I appreciated the wonderful descriptions, and the ability to use personal references to fill out some of the characters (for we all know a Veronica and her encounters in our own lives) the lack of substantive character development in the author’s words requires the reader to see the secondary characters as little more than backdrops to the scene in which Veronica exists. This book left me uncomfortable in many places: as with all good fiction, I want to think, to find the character’s motivations and look for a resolution. But, while I didn’t find the traditional answers and needs that I wanted, what I got was the author’s determination of the revelations that were needed. Veronica is deeply flawed, rife with contradictions and entirely plausible. And, like life, there are no easy answers with her story. Vallie Lynn Watson's debut novel follows thirty-something Veronica as she jolts between five-star hotels in New Orleans, New York, and the North Carolina coast. Veronica's business keeps her on the move, and further strains her relationships with the already unsuitable men she's met along the way, not to mention her blink-and-you-miss-him husband. A River So Long, like Veronica's life, is a fragmented conflation of time, place, and people-she's a gypsy, and the world she inhabits is, if not blurry, at least kaleidoscopic. This remarkable novel reads like Jean Rhys run over by the twenty-first century-a rushing, threatening, constantly changing scene with a tumultuous, multiplying cast. One random commenter during this tour will win a $25 gift card. Visit more blogs for more chances to win–the full list of participating bloggers can be found HERE. The other $25 gift card and the 3 autographed books will be given out via Rafflecopter. You can find the contest entry form linked below or on the official Luminis Literary Triad tour page via Novel Publicity. Good luck! Luminis Books was launched in January, 2010 by husband and wife team Tracy Richardson and Chris Katsaropoulos with a mission to publish thought-provoking literary fiction for children and adults. We publish what we love: Meaningful Books That Entertain. Our award-winning books engage and inform readers and explore a wide range of topics from love and relationships, teen sexual assault and homelessness to string theory, consciousness, and the Universal Energy Field. Luminis Books is a proudly independent publisher located in Carmel, IN. Visit their Website for more information. Vallie Lynn Watson's work has appeared widely in magazines such as PANK, Metazen, Moon Milk Review, Frigg, Ghoti, Nano Fiction, and elsewhere. She is an editor at Blip Magazine, formerly Mississippi Review. Watson received her doctorate at the Center for Writers, the University of Southern Mississippi, and teaches creative writing at Southeast Missouri State University.